This moist carrot cake recipe has been a long time coming. 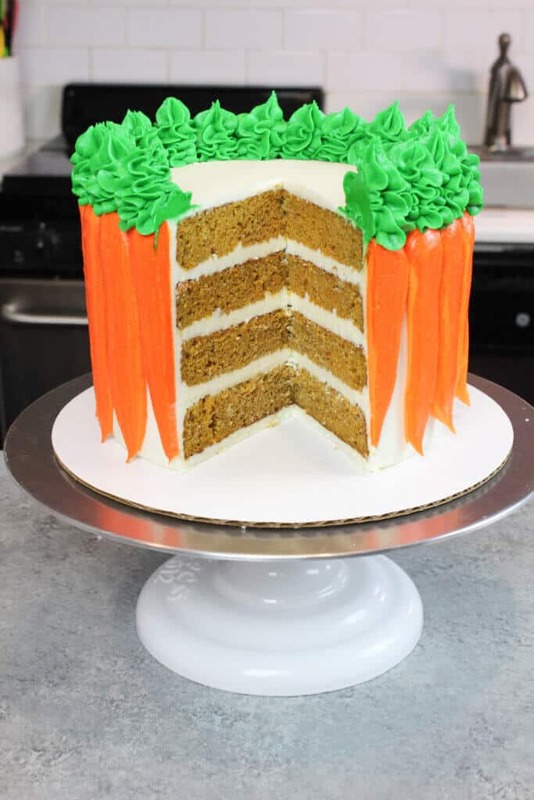 In the past, whenever I was asked to make a carrot cake, I used a very traditional carrot cake recipe. Most classic or Southern carrot cake recipes include shredded coconut, chopped walnuts or pecans, and crushed pineapple. Some even included raisins (gross, I know!). But you know what?! I never have any of those ingredients on hand. Getting all the ingredients from the grocery store felt like a chore. Which got me thinking, do I even like nuts and coconut in my carrot cake? Not really. 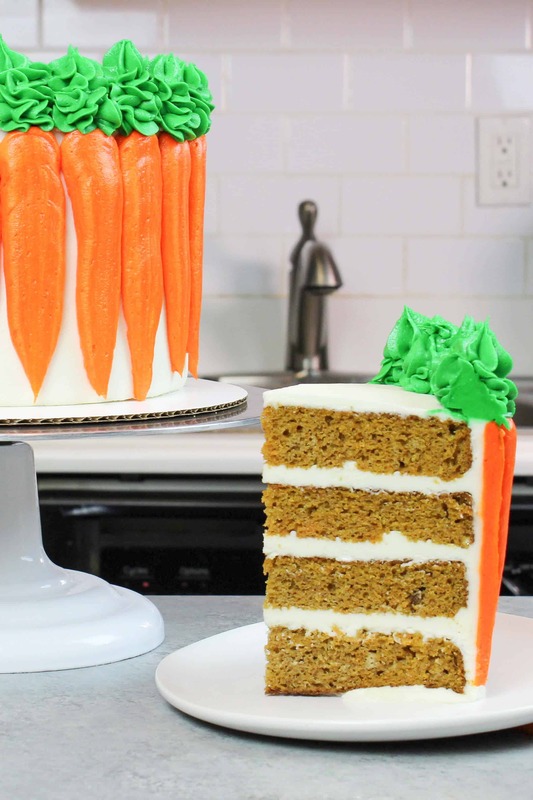 What Ingredients Really Gives Carrot Cake Its Flavor? Most of the delicious flavor we associate with carrot cake comes from the spices that are added into the batter. Ground nutmeg, ground cloves, and cinnamon are the dominant flavors in most carrot cake recipes. Some recipes also call for molasses or brown sugar, which pairs so well with these warm spices. While the additional ingredients do add to the texture of the cake, I don’t really love the mouth feel they create. If these spices create the carrot cake flavor that I know and love, why do I have to include those other ingredients I don’t even like? Why can’t a carrot cake recipe be a bit simpler, or have less ingredients? That was when I took a step back, and realized I needed to come up with a new carrot cake recipe. A moist, delicious carrot cake recipe that was nut-free (my fiance is severely allergic!). It would use ingredients I actually had in my pantry. It also could be made without using a stand mixer. Yup, this carrot cake recipe comes together in one bowl. What Makes This Carrot Cake So Moist? There are three ingredients in this recipe that make it super moist. The first is the massive amount of carrots this recipe uses! It uses an entire pound of shredded carrots. 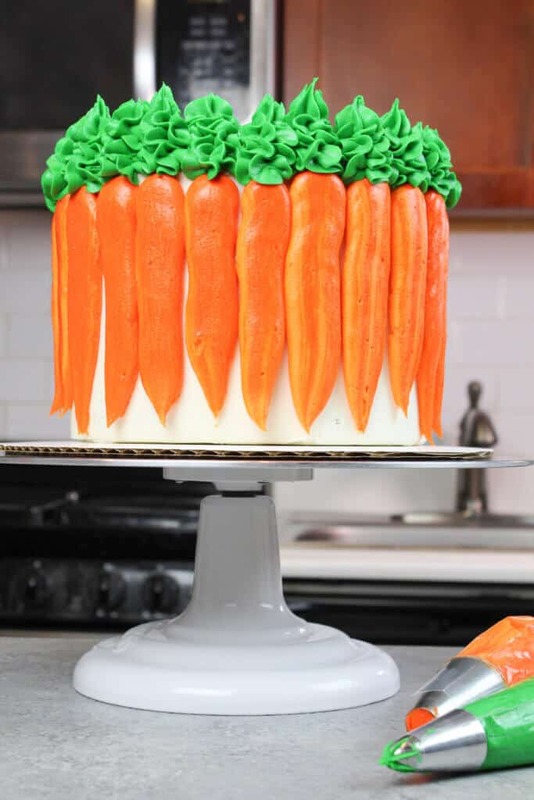 The water from all the carrots turns into steam as the cake batter bakes, which creates an amazing texture. This cake recipe also uses oil as the fat instead of butter. This adds moisture to the recipe. It also allows you to mix the carrot cake batter by hand, without a stand mixer. Share Your Creations With Me! 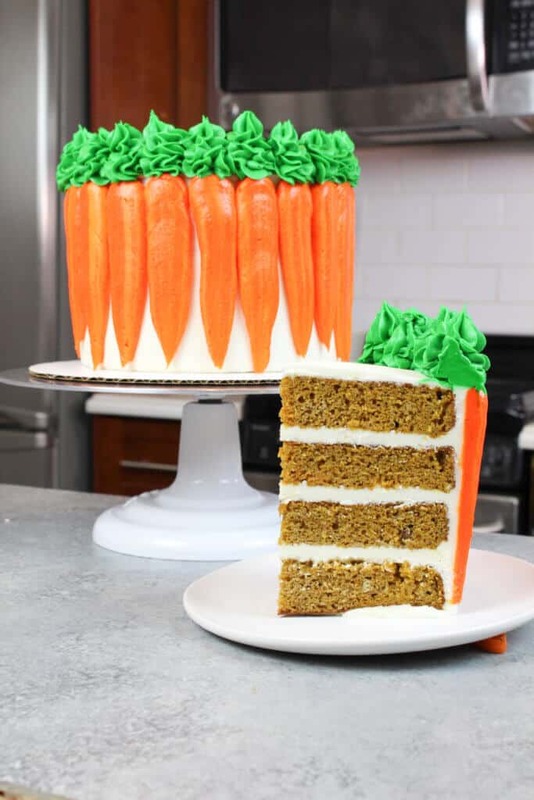 If you try this moist carrot cake recipe, please tag me @chelsweets. Also use the #chelsweets so that I can see your amazing creations! 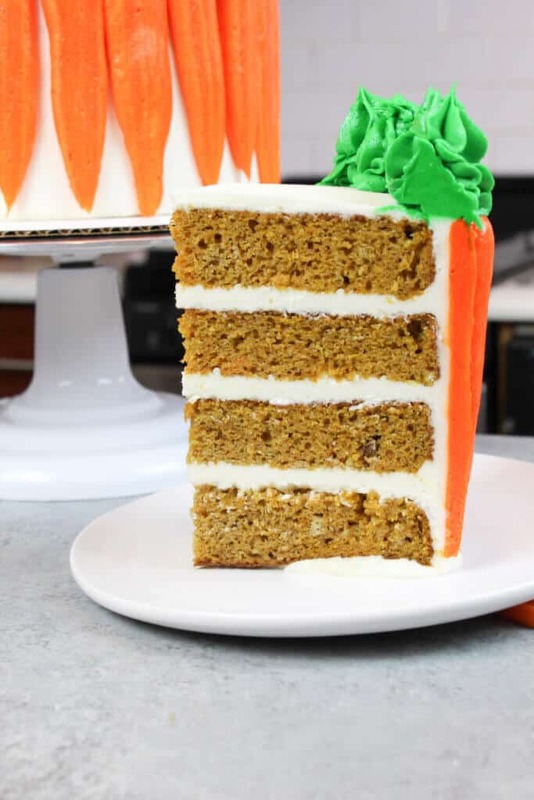 This carrot cake recipe is made in one bowl, and is super moist! One batch makes three, 8-inch cake layers, and is decorated with a delicious cream cheese buttercream frosting. Preheat oven to 350°F. Line four 7 inch pans or three 8 inch round pans with parchment rounds, and grease with non-stick cooking spray. In a large bowl, mix together the brown sugar, granulated sugar, and oil until combined. Add in the eggs, 2 at a time. Stir until the batter is smooth. Mix in the spices (cinnamon, nutmeg, and cloves), scraping the sides of the bowl while mixing. Add the baking soda, baking powder, and salt into the batter, and mix in. Add half of the flour, and mix until just combined. Be careful not to over mix! Stir in the canola oil, vanilla extract, and buttermilk. Mix in the remaining flour. Once the ingredients are fully combined, fold in the grated carrots. Divide batter evenly between the prepared cake pans. I like to use a digital kitchen scale to weigh my pans, and ensure they all have the same amount of batter. This guarantees your layers will bake to be the same height. For 7-inch cake layers, bake for 25 minutes. If you made three, 8-inch cake layers, bake for about 27 minutes, or until a toothpick comes out clean. Allow the pans to cool for 10 minutes, then run an offset spatula around the perimeter of the pans to separate the cake layers from the pan. Place cake layers in the freezer for 45 minutes, to accelerate the cooling process. Once the layers are fully cooled, carefully flip the pans and remove the layers from the pans. While the cake layers bake and cool, make the cream cheese frosting. Beat the butter and cream cheese on a medium speed for 30 seconds with a paddle attachment, until smooth. Add in the vanilla and salt, and beat on low until the ingredients are fully incorporated. Slowly mix in the powdered sugar on a very low speed, 1 cup at a time. Alternate with small splashes of cream. Place 1 cup of frosting in a separate bowl, and color it green with gel food coloring. Place in a piping bag fitted with a Wilton 1M or 2D frosting tip. In a separate bowl, add 2 cups of frosting and color it orange with gel food coloring. Place in a piping bag fitted with a large round piping tip, or an opening cut about 1.5 cm wide. Cover the uncolored cream cheese frosting with a piece of plastic wrap, to prevent a crust from forming until you're ready to use it. Stack the cake layers, adding an even layer of cream cheese frosting between each cake layer. Frost the top and sides of the cake with a moderately thick layer of frosting (thicker than a crumb coat), to fully cover the cake layers. Smooth using a bench scraper, then chill the cake in the fridge (20 minutes) or freezer (5 minutes) until the frosting is firm to the touch. 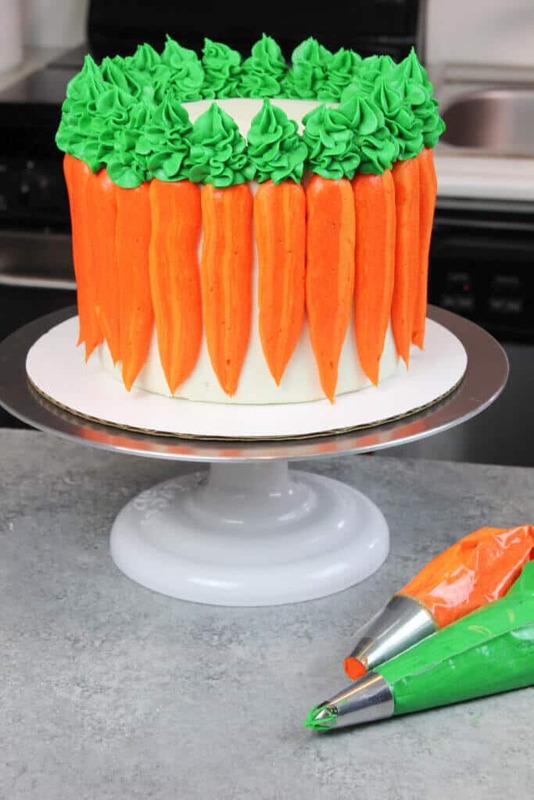 Pipe vertical lines of orange frosting on the sides of the cake to look like carrots. Pipe green frosting swirls around the top perimeter of the cake to look like carrot tops. One batch of cake batter makes about 1820 grams, so when I'm making a cake with four layer, I add 455 grams of batter into each pan. Since this frosting will be used to decorate a cake, it is important to mix the buttercream on the lowest speed at the end of the process for a couple minutes, to get out any extra air that might have be incorporated during the mixing process. The frosting recipe above is 1.5 batches of my buttercream, which is the amount I usually make for 7 or 8 inch cakes. This makes enough buttercream to add a generous amount between the cake layers, and to have leftover buttercream for any special decorations. If you have extra buttercream you don't use, it can be stored in the fridge.